Lasts for about 400 puffs (equal to about a pack and a half of traditional cigarettes), blu disposable electronic cigarettes make the perfect travel companion. Easily lip them into your pocket, briefcase or purse, and enjoy the refreshing blast of a blu eCigs electronic cigarette wherever you are or are going. Stunning blue LED lights up with each puff. Equal to approximately a pack and a half of traditional cigarettes, our disposable electronic cigarette combines the battery, atomizer and cartridge into one single piece construction. Easy to use rightout of the box, with no assembly required. Just pull activation tab and your disposable electronic cigarette is ready for action! 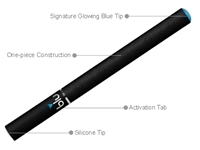 Designed with a single hole for maximized draw and resistance, the silicone tip creates a traditional cigarette feeling. Mouth piece of the disposable electronic cigarette is engineered to prevent leakage. With no assembly and nothing to recharge, blu Disposables are the ideal choice for first time electronic cigarette users. Equivalent to a pack-and-a-half of traditional cigarettes, this disposable electronic cigarette is compact, highly portable and ready to use right out of the package making it an excellent travel partner.